7 − six = Required Please enter the correct value. (Kitco News) – World stock markets were mostly weaker overnight, amid still-heightened geopolitical tensions. U.S. stock indexes are pointed toward modestly lower openings when the New York day session begins. 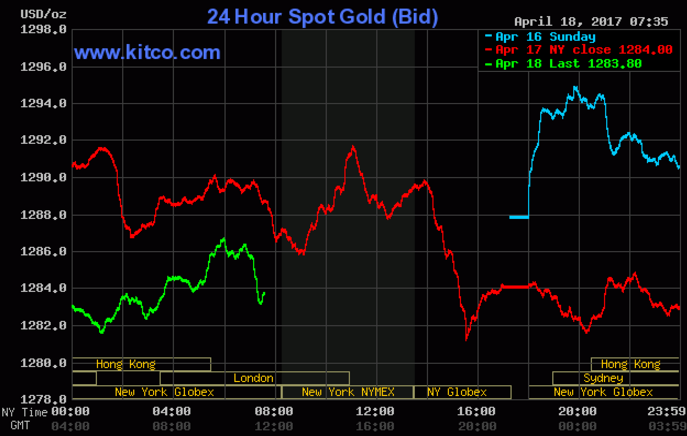 Gold prices are weaker on a mild corrective pullback from recent good gains that saw prices hit a five-month high on Monday. In overnight news, U.K. Prime Minister Theresa May surprised the marketplace by calling for snap general elections in June. The British pound jumped higher on the news. The first round of the French presidential elections will be held this coming Sunday. The second round will be on May 7. European market watchers are getting more nervous as the French elections approach and polls show tight races. The key outside markets on Tuesday morning see the U.S. dollar index trading weaker. The greenback bulls have lost their overall near-term technical advantage. Meantime, Nymex crude oil prices are also modestly lower on ideas U.S. shale-oil production will continue on the rise. The crude oil bulls do still have the overall near-term technical advantage. U.S. economic data due for release Tuesday includes the weekly Johnson Redbook and Goldman Sachs retail sales reports, new residential construction, and industrial production and capacity utilization. Follow Jim Wyckoff @jimwyckoff for breaking news.